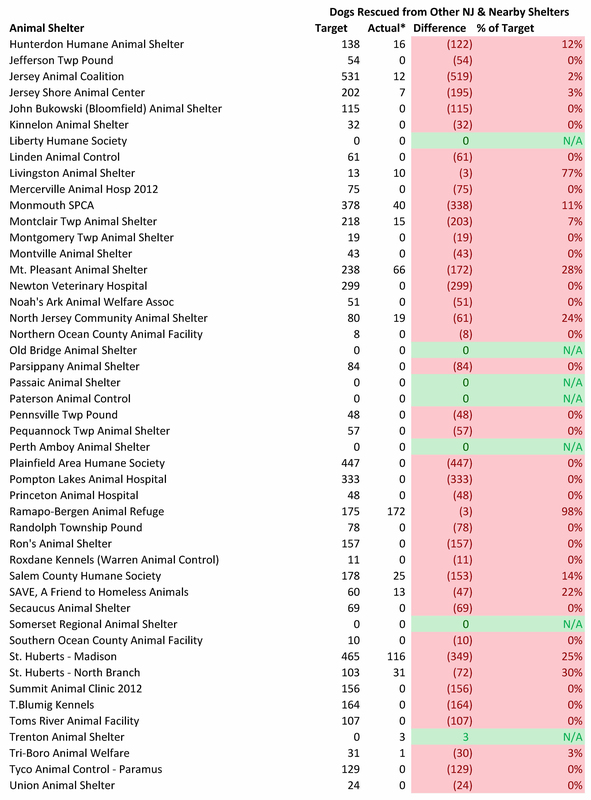 In my last blog, I disclosed New Jersey’s depressing animal shelter statistics. This blog explains why so many dogs are losing their lives in the state’s animal shelters and whether these facilities can end the killing. 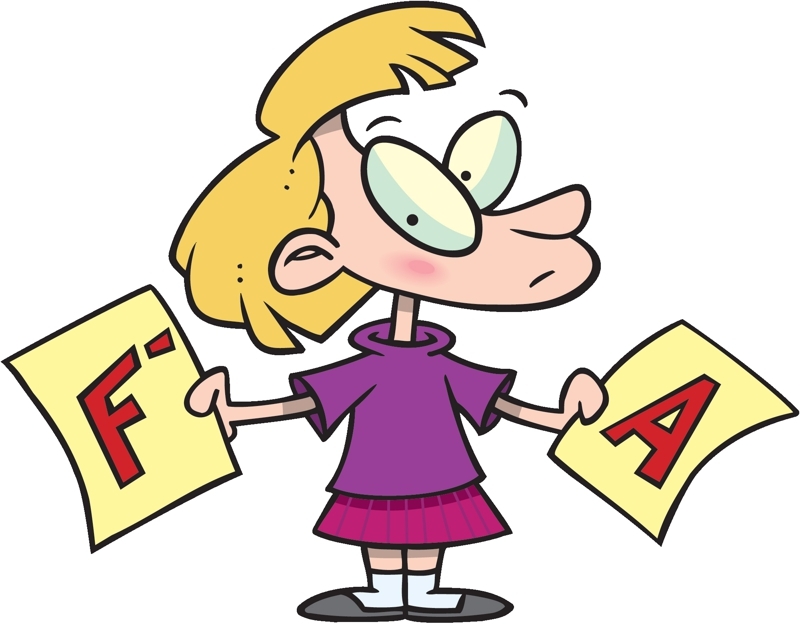 Successful organizations set measurable goals and regularly monitor their performance. Examples include financial budgets, customer and employee satisfaction surveys, and product reliability metrics. Unfortunately, many animal shelters for far too long have failed to set lifesaving goals and standards. Municipalities, donors and volunteers need to know where their resources will be best utilized. Time and money are scarce resources and people should allocate these assets to organizations who will best utilize them. As a result, animal shelters need to set goals and hold their leadership and staff accountable for achieving these objectives. In order to assess how good of a job New Jersey animal shelters are doing, I’ve developed an analysis I call the “Life Saving Model.” While shelter performance is dependent on many variables, such as finances, facility design, local laws, etc., the most critical factor impacting potential life saving is physical space. Without having enough physical space, a shelter might not have enough time to find loving homes for its animals. Shelters can overcome financial limitations through creative fundraising or recruiting more volunteers. Similarly, organizations can save their dogs despite having run down facilities if these groups enthusiastically implement policies to get animals into loving homes quickly. As a result, my analysis focuses on making the best use of space to save the maximum number of New Jersey dogs. The Life Saving Model measures the number of local animals a shelter should adopt out, rescue from other facilities, send to rescues or other shelters, and euthanize. The targeted outcomes take into account each facility’s physical capacity and the number and types of dogs the organization receives from its community (i.e. strays, owner surrenders, cruelty/bite cases). I assume a target euthanasia rate, take the number of dogs actually returned to owners and then estimate how many community dogs a shelter should adopt out. To the extent space runs out, I then calculate how many dogs must be sent to rescue. If the shelter has excess space after properly serving its local community, the facility uses that room to rescue and adopt out dogs from nearby areas. The targeted results calculated from this model are compared to the actual or estimated actual results from each shelter below. New Jersey’s animals shelter system has enough space to save all of the state’s healthy and treatable dogs. 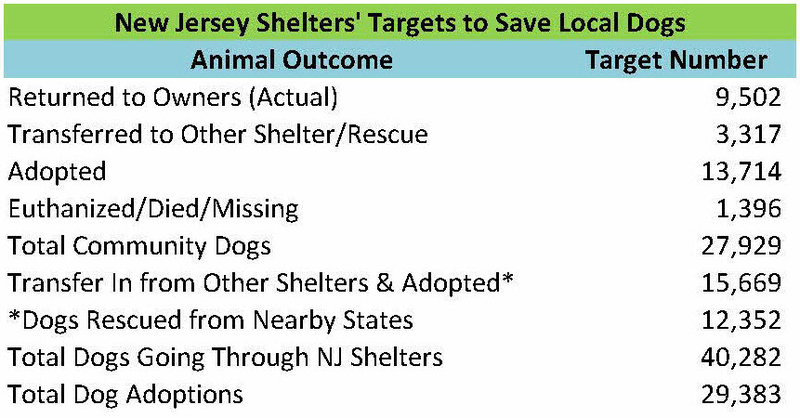 The table below details the targeted numbers of dog outcomes the New Jersey animal shelter system should achieve. Out of the 27,929 New Jersey dogs coming into the state’s animal shelters in 2013, 13,714 and 3,317 dogs should have been adopted out and sent to other shelters/rescues by the facilities originally taking the dogs in. However, other New Jersey animal shelters had more than enough capacity to rescue the 3,317 dogs from space constrained facilities. Thus, New Jersey animal shelters should be able to able to adopt out every single healthy and treatable dog taken in from the state and not require any support from rescue organizations without physical facilities. Additionally, New Jersey animal shelters could save another 7,644 dogs from other locations outside of the state. Of course, some New Jersey animal shelters do pull some dogs from New York City and Philadelphia animal control shelters. However, most of these dogs are likely easy to adopt and therefore have short lengths of stay. As a result, the additional number of dogs New Jersey animal shelters could save from New York City, Philadelphia and elsewhere is probably not much lower than the figure above. Thus, New Jersey animal shelters could make New Jersey a no kill state for dogs as well as many other places. Thus, many communities are already adopting out nearly three times as many dogs as the goal set for New Jersey animal shelters. Some naysayers may claim New Jersey would have a more difficult time due to the state’s shelters taking in many pit bulls. However, this is a myth. My model estimates New Jersey animal shelters would need to adopt out roughly 0.70 pit bulls per 1,000 people to save 95% of New Jersey’s dogs. Our shelters would only need to adopt out 1.81 pit bulls per 1,000 people if New Jersey shelters also rescued and adopted out the targeted number of pit bulls from other states. As a comparison, I estimate Longmont Humane Society adopts out 2.14 pit bulls per 1,000 people based on its per capita pit bull intake and the percentage dog adoptions are of total outcomes at the shelter. Furthermore, the pit bull adoption targets are even more reasonable given the model assumes there are roughly 2/3 less dogs to compete with in the adoption market in New Jersey than these other locations. The goal of any properly managed animal shelter is to save all of its healthy and treatable animals. In some cases, such as selective admission rescue oriented shelters, it is pretty easy to not kill animals. In addition, other animal shelters with easy to service animal control contracts (i.e. few animals impounded, most strays quickly returned to owners) can avoid unnecessary killing due to having lots of extra space. As a result, some shelters may have an easier time than others in preventing killing at their shelters. The table below compares the targeted number of community dogs (strays, owner surrenders, cruelty/bite cases) euthanized and the estimated actual local dogs euthanized/killed, and who died or went missing. Consistent with the Life Saving Model’s assumptions, the estimated actual dogs euthanized/killed/died/missing figure assumes these dogs came from the local community. All dogs missing are assumed “dead” based on the assumption they died or went to a very bad place. 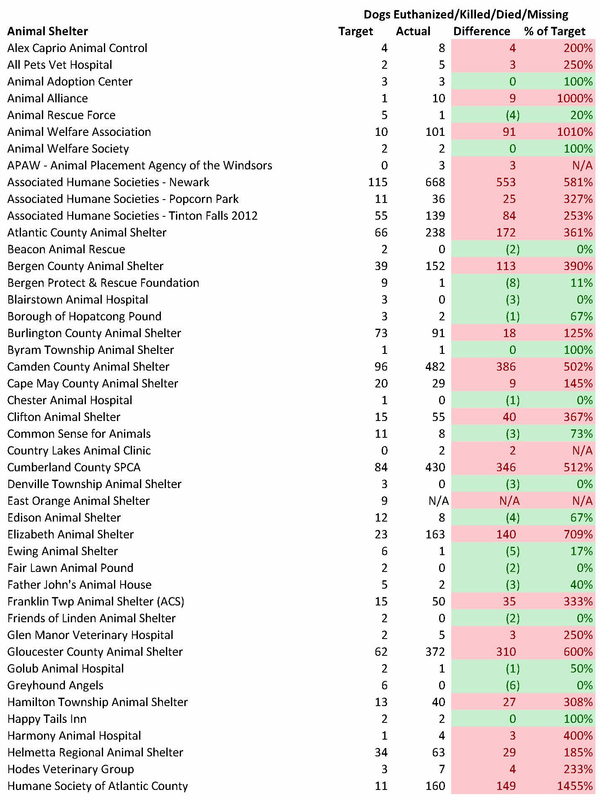 Shelters having less and more than the targeted amount of dog deaths are highlighted in green and red in the table below. Thus, I find it difficult to believe St. Huberts – Madison’s and Humane Society of Atlantic County’s larger than expected number of dogs dying or gone missing is due to them rescuing a large percentage of their dogs from other shelters. Furthermore, if additional unaccounted for dogs discussed in my previous blog are counted in the death totals, the number of unnecessary dogs deaths rises from 3,603 to 4,731 statewide. Associated Humane Societies – Newark’s number of unnecessary deaths jumps from 553 to 805 dogs assuming these additional unaccounted for dogs died. Some animal shelters will require more support from rescues and animal shelters with excess space than others. If a shelter has relatively high intake, very limited space, and few stray dogs returned to owners, it will need more help than other shelters. 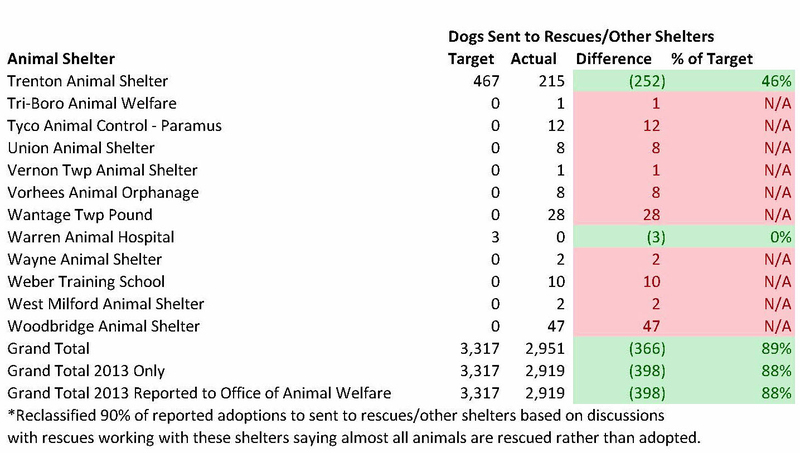 The table below compares the number of dogs a shelter should transfer to other organizations per the model and the number of dogs actually sent to other animal welfare groups. Shelters marked in green are receiving less than the expected rescue support while facilities marked in red are receiving too much rescue help. Overall, New Jersey shelters are not receiving enough help from other animal welfare organizations. While the overall number of dogs rescued was only about 11%-12% lower than needed, the actual number was higher since many dogs were rescued from facilities who did not need any rescue assistance. Only 16 out of the 102 facilities require any rescue support. In other words, 86 of the 102 animal shelters in the state should not need rescues or other shelters to pull any dogs. As a result, 1,756 dogs were not rescued from shelters who truly need that support and instead were pulled from shelters not requiring this help. Unsurprisingly, these shelters had some of the highest dog death rates during the year. Rescue groups and shelters with extra space should pull dogs from kill shelters with the highest rescue “target” numbers and deficits in the table below. If shelters not needing rescue support get that extra help, these shelters will not take the steps necessary to properly run their facilities. As a result of enabling poorly performing shelters and not pulling dogs from truly space constrained facilities, rescuing dogs from shelters with enough space leads to less lifesaving. Given killing animals for space is intolerable, the space-constrained shelters need to expand their effective dog capacity. These facilities could use extra space in their buildings to house dogs on a short-term basis. These shelters can enter into arrangements with local veterinarians to house and adopt out some dogs. Furthermore, shelters can create or expand foster programs to increase the number of dogs cared for. Additionally, creating a pet owner surrender prevention program and making serious efforts to return lost dogs to owners could free up space in these shelters. Finally, space-constrained shelters with multiple animal control contracts should terminate some of these arrangements to bring their capacity for care in line with the number of dogs they take in. As a result, space constrained shelters still need to take active steps to reduce killing rather than simply solely relying on rescue support. We can assess each shelter’s contribution to making New Jersey and nearby areas no kill. While a shelter may be able to avoid killing healthy and treatable animals, it still may not live up to its potential for adopting out local dogs. On the other hand, a space constrained shelter may kill healthy and treatable dogs, but still do a good job adopting animals out. 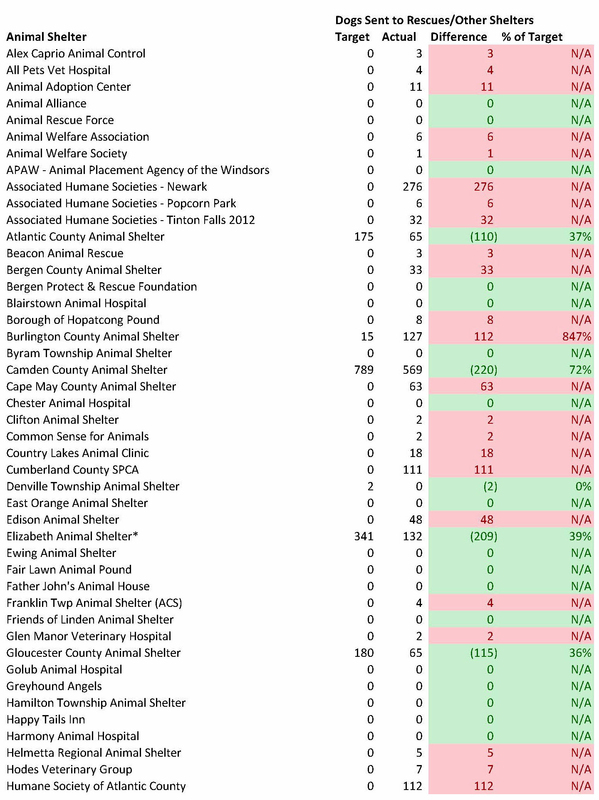 The table below compares the number of dogs from New Jersey and nearby states each animal shelter should adopt out with the estimated number of local dogs actually adopted out. Shelters with very limited space and high kill rates as well as rescue oriented organizations may look better than they actually are. For example, the model assumes the mix of dogs facilities are adopting out are the same as the types of dogs these groups take in. However, if these shelters only adopt out a very small number of dogs due to limited physical capacity, the dogs adopted out may be highly adoptable ones with much shorter lengths of stay compared to the majority of dogs these facilities impound. Similarly, many rescue oriented shelters likely pull much easier to adopt dogs than the bulk of dogs needing to get rescued from local facilities. Thus, the results from shelters with very limited capacity and rescue oriented organizations may look better than they actually are. Few organizations reached or exceeded their adoption targets. Specifically, only 7 out of 102 shelters met the adoptions goals computed by the Life Saving Model. 2 of the 7 facilities reaching the adoption targets (Denville Township Animal Shelter and Warren Animal Hospital) had very few animals to place. Thus, the overwhelming number of New Jersey animal shelters need to step up their adoption efforts. Several shelters exceeded their adoption targets. Old Bridge Animal Shelter had the most impressive results by far. This facility adopted out nearly 4 times the number of dogs targeted by the Life Saving Model and only euthanized 1% of all their dogs who had outcomes. Surprisingly, Livingston Animal Shelter adopted out the targeted number of dogs despite having a run down facility with limited adoption hours. The facility may have accomplished this by having a caring animal control officer who could place a relatively small number of dogs. Beacon Animal Rescue also exceeded its adoption target. While this organization is a rescue oriented group, the shelter appears to help more than easy to adopt dogs as pit bull type dogs currently make up about half of their dogs up for adoption. Perth Amboy Animal Shelter also deserves credit for nearly reaching its adoption target while only 3% of its dogs were euthanized. Only a few years before, 25% of Perth Amboy Animal Shelter’s dogs were killed by the prior shelter management. Liberty Humane Society and Trenton Animal Shelter also exceeded their targeted number of local dog adoptions. These two facilities are space constrained shelters with high kill rates and the dogs they adopted out potentially may have been more adoptable than the bulk of their dogs. In the case of Liberty Humane Society, I’ve anecdotally observed them adopting out a large percentage of pit bulls and believe they are doing a good job on dog adoptions. Either way, both Liberty Humane Society and Trenton Animal Shelter are performing better than many other similar facilities and rescues/other shelters should support these organizations by pulling more dogs from Liberty Humane Society and Trenton Animal Shelter. Many shelters with the ability to help other local shelters fail to do so. New Jersey animal shelters have the potential to rescue and adopt out nearly 5 times as many dogs as the number of dogs unnecessarily dying in the state’s animal shelters. Approximately 40% of the adoption shortfall is due to shelters not using their existing capacity to adopt out their own dogs or rescue dogs from space constrained nearby facilities. The other 60% of the adoption shortfall is due to shelters not adopting out animals as quickly as these organizations should. Thus, New Jersey animal shelters fail to even come close to their adoption potential. Associated Humane Societies performance is particularly disappointing. Specifically, Associated Humane Societies has the physical capacity to end the killing of all healthy and treatable dogs in New Jersey. Associated Humane Societies adoption shortfall of 5,453 dogs significantly exceeds the 3,603 dogs unnecessarily losing their lives in New Jersey animal shelters. 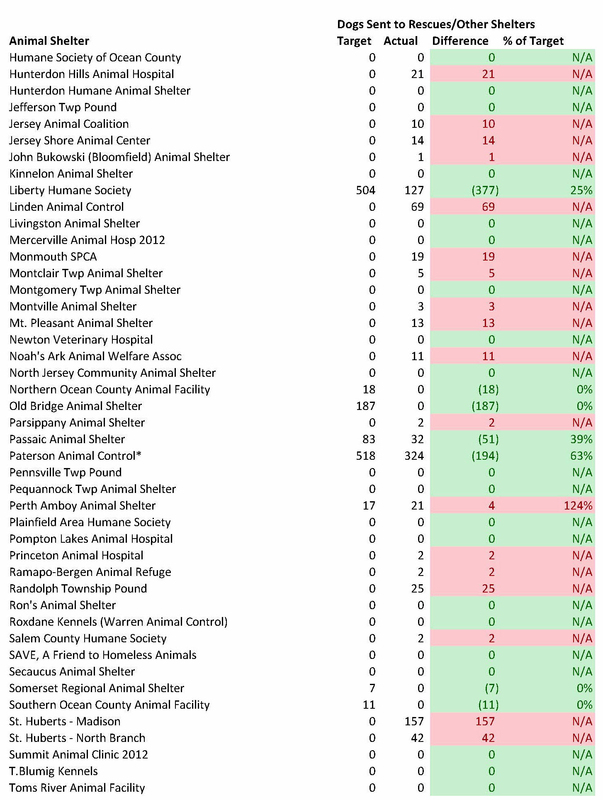 Even if all three Associated Humane Societies’ shelters used just 50% of their reported dog capacity, the organization could reduce the number of dogs unnecessarily dying in New Jersey animal shelters by nearly half per my model. Furthermore, Associated Humane Societies may put an additional strain on New Jersey’s animal welfare system by sending dogs to other facilities and rescues in the state when Associated Humane Societies has more than enough capacity to handle its dogs. Associated Humane Societies has the funding to reach these adoption targets as the organization took in nearly $9 million of revenue last year. This works out to over $450 of revenue per dog and cat I project the shelter should take in per my Life Saving Model. As a comparison, Nevada Humane Society, KC Pet Project, and Upper Peninsula Animal Welfare Society, which are no kill open admission shelters, took in only $225-$415 of revenue per dog and cat. Activists wanting to increase life saving in New Jersey should focus on changing Associated Humane Societies’ policies given the lifesaving potential of this organization. 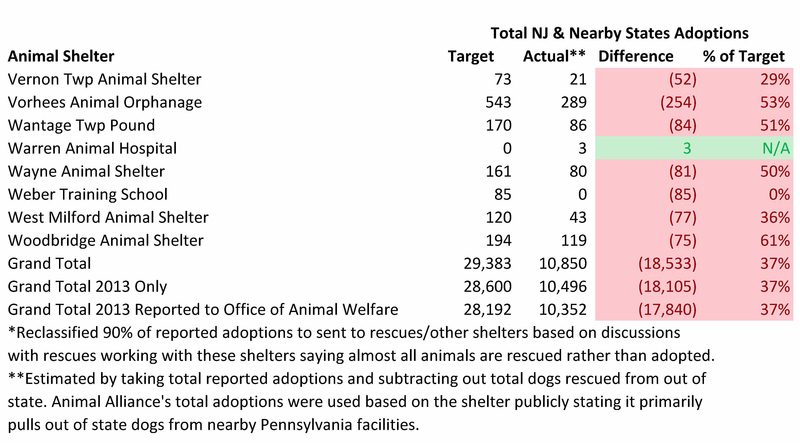 Shelters transporting dogs from out of state also significantly failed to achieve their adoption targets for New Jersey dogs. In fact, shelters rescuing dogs from out of state facilities have a New Jersey dog adoption shortfall exceeding the number of New Jersey dogs unnecessarily dying in our state’s shelters. Not surprisingly many of these facilities’ total adoptions including transported dogs exceeded the local dog adoption targets as most transported dogs are easier to adopt. 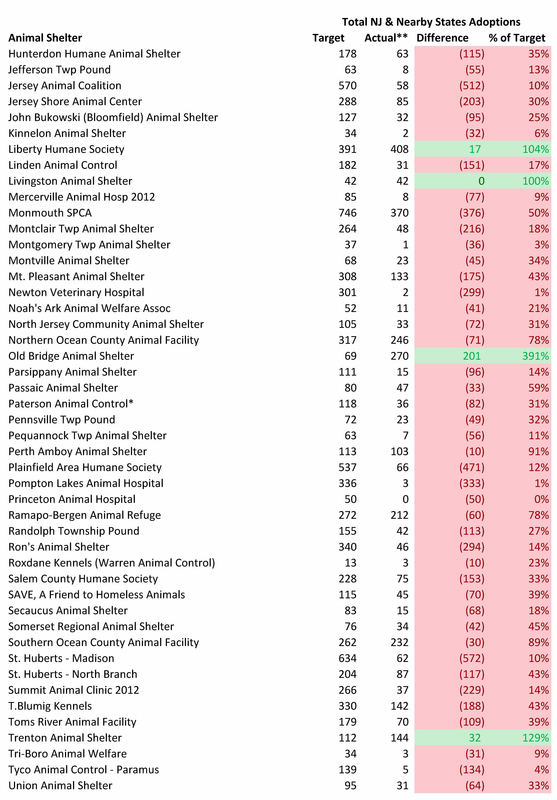 These transporting shelters’ local adoption performance is even worse considering most of these organizations likely take in much more adoptable local dogs than my model targets. 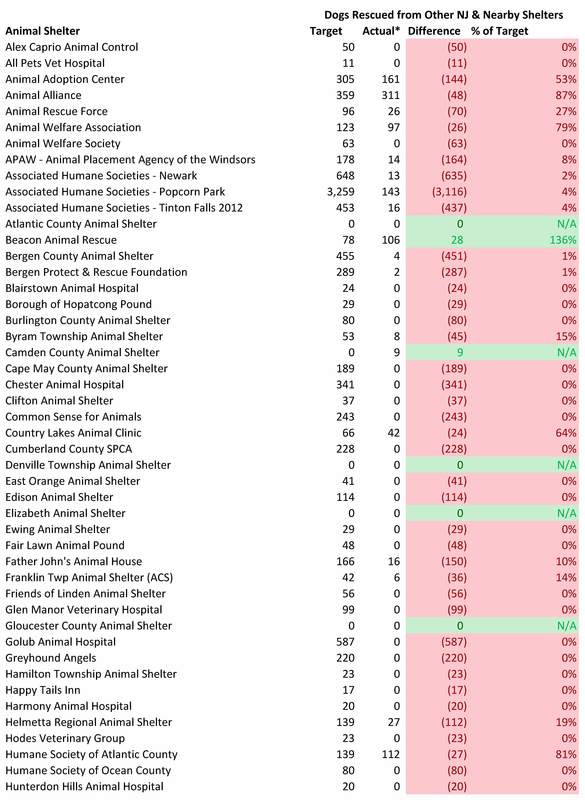 In addition, the revenues these transporting shelters bring in from adoption fees and dramatic fundraising stories likely divert funding from New Jersey animal control shelters. Thus, it is quite clear most transporting shelters are not doing their part in helping New Jersey’s homeless dogs. 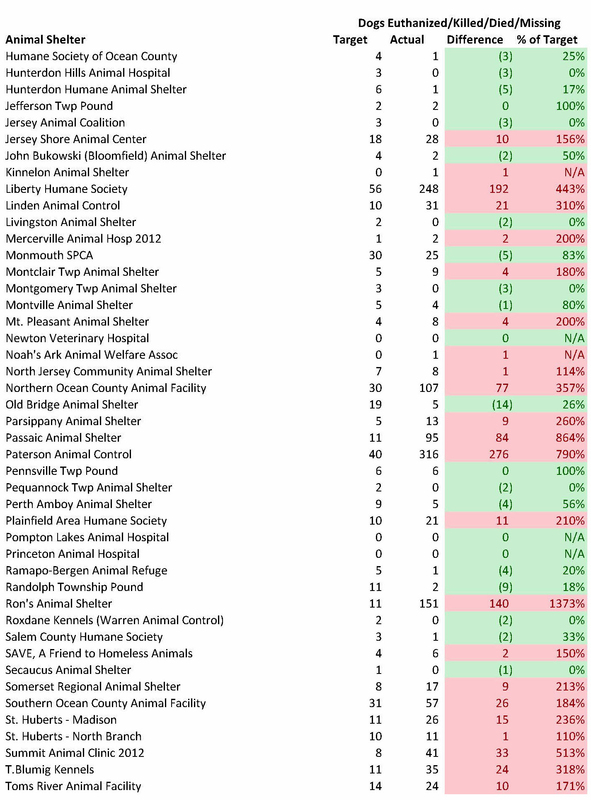 To further examine New Jersey animal shelters’ performance in saving the state’s homeless dogs, I compared the targeted number of dogs each shelter should pull from nearby shelters and compared it to the number actually rescued from local facilities. I assume all reported out of state rescued dogs came from southern or other far away states. While some of the out of state rescued dogs may have comes from nearby areas, I believe this is a small number and does not significantly impact the results. Virtually all New Jersey animal shelters are failing to rescue the number of local dogs they should. 89 of the 102 shelters should rescue some dogs from other local shelters. In fact, 55 of the 89 shelters with targeted excess capacity failed to rescue even a single dog from a New Jersey animal shelter. Of the 89 shelters with the space to rescue dogs from nearby shelters, only Beacon Animal Rescue met or exceeded its local dog rescue target. While Animal Alliance and Ramapo-Bergen Animal Refuge appear to come close to their targeted local rescues, this is most likely due to these organizations pulling relatively few pit bulls. 80% of the targeted rescues are pit bulls while Animal Alliance and Ramapo-Bergen Animal Refuge only appear to have pit bulls representing around 20% of their dogs currently up for adoption. Thus, nearly all New Jersey animal shelters with targeted excess capacity are failing to do their share in ending the killing of local healthy and treatable dogs. Shelters can overcome challenges in rescuing dogs from outside their service area. In some cases, municipalities may frown on government run shelters using taxpayer funds to rescue dogs from elsewhere. However, shelter directors at these facilities can encourage individuals to form a non-profit or raise money on their own to pay for these rescued dogs. Additionally, shelters with limited capacity or even some of the well-off private shelters could contribute funding for each dog rescued. For example, Maddie’s Fund paid an approximate $160 subsidy to rescues pulling dogs from New York Animal Care & Control. Similarly, private shelters with excess space, but limited financial resources, could expand their fundraising efforts to save more local dogs. Thus, perceived obstacles to rescuing local dogs can and should be overcome. The improper allocation of space within the state’s animal shelter system requires organizations to form coalitions. While putting a competent and compassionate director in every shelter would likely be even more effective, that will likely take time to do. No kill coalitions between animal control facilities and selective admission shelters have been used in places, such as Portland, Oregon, Reno, Nevada, Jacksonville, Florida and Austin, Texas to radically increase life saving. Maddie’s Fund, which has supported using coalitions for over a decade, has many resources for organizations seeking to collaborate with each other. Thus, New Jersey animal shelters need to formally work together, develop quantifiable and measurable goals (such as the targeted outcomes in this blog), and hold each organization accountable for meeting these goals. 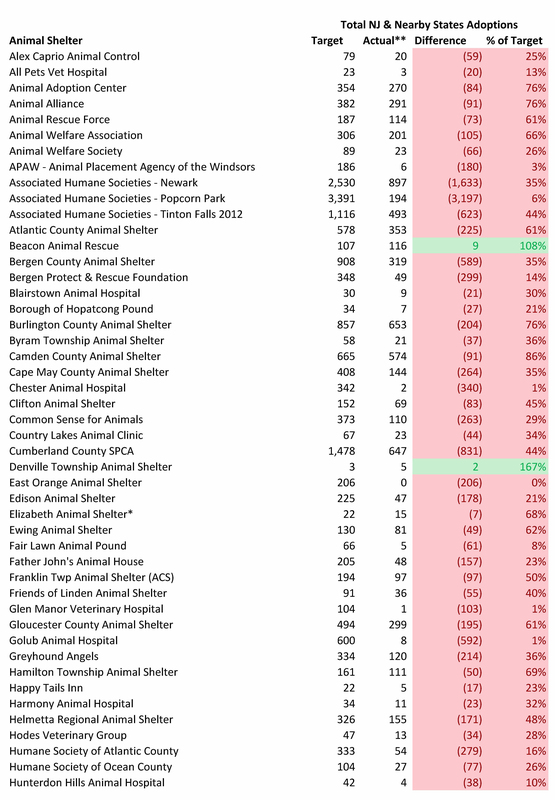 New Jersey animal shelters’ dismal performance is even worse considering I used conservative assumptions. Organizations were not expected to return additional lost dogs to owners despite room for significant improvement. The targeted adoption lengths of stay ranged from 34-40 days for dogs taken in from the local community and 44 days for dogs rescued from other local shelters. However, some no kill open admission shelters adopt dogs out much more quickly. For example, I estimate dogs only take about 15 days to get adopted at Williamson County Animal Shelter in Texas based on their operating data and total average length of stay. Similarly, some no kill open admission shelters, such as Greenhill Humane Society and KC Pet Project, adopt out their pit bulls in much less time than the benchmark shelters used in this analysis. 50 days was used in my model, but Greenhill Humane Society’s and KC Pet Project’s (estimated) corresponding figures are around 40 days and 19 days. Additionally, creating successful pet retention and targeted spay/neuter programs could reduce local intake and allow shelters to rescue more dogs from elsewhere. Thus, New Jersey animal shelters could save significantly more animals than the targeted numbers I computed. Shelters should examine the reasons why their adoption numbers fall far short of these benchmarks. In some cases, shelters, such as Woodbridge Animal Shelter, need to expand the hours they are open for adoptions. Many shelters should switch from an overly judgmental adoption process based on black and white rules to a conversational one focused on educating the adopter. Organizations will need to radically increase their off-site events and do same day adoptions. Similarly, many shelters must reduce adoption fees and run frequent promotions. Executive Directors should monitor the latest life-saving programs on Maddie’s Fund’s, ASPCA Pro’s, and the Best Friends National Conference’s web sites and put some of these policies into place. Shelter management teams will need to ensure their facilities are clean and customers are treated with respect (this can be measured by encouraging the public to complete surveys). Thus, poorly performing shelters need to stop making excuses and do what it takes to reach their adoption potential. Shelters truly wishing to save lives should be ecstatic with the results from this analysis. The organizations have the potential to save far more lives than they ever thought were possible. Will the leaders of these facilities take the initiative to improve their performance as anyone with a job outside of animal sheltering would do? Thousands of lives depend on the answer to this question. We can turn New Jersey, New York City and Philadelphia into no kill communities. It is time we give our money and volunteer efforts to organizations who raise their performance to help us reach that goal. To do otherwise, would betray all the animals whose lives are on the line. Each shelter’s community dog intake (i.e. owner surrenders, strays, cruelty bite cases), number of dogs returned to owners, and maximum dog capacity were taken from its 2013 “Shelter/Pound Annual Report” submitted to the Office of Animal Welfare. Unfortunately, 2014 data will not be available until Fall 2015. Community dog intake and dogs returned to owners were initially estimated for each month by dividing the annual figures by 12. In order to take into account the extra space in low intake months and reduced space in high intake months, we multiply that number by each month’s percentage of the average month. For example, assume 240 dogs were taken in during the year and the average month equals 20 dogs (240/12). In July, the dog intake is 120% higher than the average month and we therefore multiply 20 dogs by 1.2 to equal 24 dogs. If 120 dogs were returned to owners during the year, the estimated number of dogs returned to owners in July would equal 12 dogs (120/12 = 10; 10*1.2). The monthly intake percentages were based off 2013 dog intake data on the New York Animal Care & Control web site. The estimated number of community dogs returned to owners each month are then assumed to stay 5 days on average at shelters based on data from other shelters across the country. If anything, this estimate is conservative (i.e. average length of stay for dogs returned to owners may be less than 5 days and therefore frees up more shelter space for adoptions) based on some shelters returning the bulk of their dogs to owners within 3 days. The number of community dogs euthanized (including animals who died or are missing) is set to equal 5% of intake. 5% is a reasonable standard euthanasia rate for shelters in New Jersey to meet given few vulnerable stray puppies (i.e. who could die or require euthanasia) arrive in the state’s animal shelters. The average length of stay for euthanized dogs is assumed to equal 14.5 days. Half of dogs are assumed euthanized for untreatable aggression towards people and 21 days is the time estimated to make that determination. The other half of dogs are assumed euthanized for severe and untreatable health issues and I estimate these dogs are euthanized after 8 days (subsequent to the end of the stray and owner surrender hold periods). 80% and 20% of each communities dogs (including pit bulls) were adults 1 year and older and under 1 year. Pit bulls were assumed to comprise 50%, 35% and 25% of community dog intake at poor, middle/upper middle class, and wealthy area animal control shelters. While some shelters may have pit bulls comprising more than 50% of their shelter dog population at a given time, this is due to pit bulls longer average length of stay. For example, a shelter with pit bulls making up 50% of their dog intake and pit bulls having an average length of stay three times longer than other dogs will have pit bulls constituting 75% of the dog population. Shelters without animal control contracts were assumed to only have pit bulls make up 10% of their community dogs (i.e. strays and owner surrenders) based on most of these shelters’ highly selective admission practices. Dogs transferred to rescue or other facilities are assumed to stay at shelters 8 days on average based on the assumption strays can’t be released until the 7 day hold period elapses. Community dogs not returned to owners or euthanized are initially assumed as adopted for each month. However, if the calculated length of stay exceeds the shelter’s required length of stay, dogs are moved from adoption (i.e. with a longer length of stay) to rescue (i.e. shorter length of stay) until the calculated length of stay each month approximately equals the required length of stay. Shelters with excess capacity are assumed to use the extra space to rescue and adopt out dogs from other New Jersey animal shelters. To the extent all healthy and treatable New Jersey animal shelter dogs are saved, I assume additional dogs are pulled from nearby states with similar types of dogs. I assume all rescued dogs will not be killed since the transferring and receiving shelters should evaluate these dogs’ behavior. Based on pit bull type dogs having longer lengths of stay at shelters, I assume 80% of dogs rescued from local animal shelters are pit bulls and 20% are non-pit bulls. 80% and 20% of pit bull and non-pit bull type dogs are considered 1 year and older and under 1 year. The average length of stay for rescued pit bulls and other dogs are the same as above. Each month’s targeted outcomes are added to determine how many local dogs New Jersey animal shelters should adopt out, send to rescue, rescue from other nearby animal shelters and euthanize.